After getting disemboweled by Cyber in a fight, Wolverine endures feverish dreams of his past with Cyber. While they don’t seem to make much sense on the surface, we can piece together that at one time, Logan and Cyber were rivals of a sort over a girl named Janet. Wolverine’s feverish dreams continue suggesting that Cyber was a teacher or trainer of sorts for Logan and their rivalry over Janet ended in her death. Further, it seems that Cyber challenged Logan’s courage. As Wolverine’s feverish dreams of his past with Cyber come to end, it becomes apparent that Cyber manhandled Logan in a fight. Logan reveals to Tiger Tyger that Cyber was “…an old associate. Someone I looked up to in my misbegotten youth. Then we had a falling out. A woman was involved. It got ugly. Things were said. Things were done. Scars were left… He beat me.” It seems that Cyber beat him so badly that he can barely remember the events, noting that Cyber left him for dead without working up a sweat. Cyber reminds Wolverine that he was Logan’s teacher and admits to killing Logan’s girlfriend. In a hallucinogenic dream, Cyber reveals his true name is Silas Burr. The suggestion, however, that Silas Burr worked with William Burke and William Hare (infamous for the West Port murders of 1827-1828) seems farfetched, though clearly he does possess some ability to overcome aging. A newly resurrected Cyber explains that he used to be known as Silas Burr and “…train bad guys to be worse. Not many people liked me back then. Especially the ones I trained. 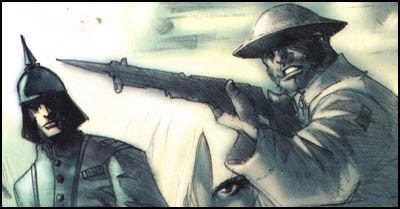 One, in particular, took it very personally.” Cyber’s memory flashbacks show that person to be Logan, and judging from the artwork, it would seem that Cyber, as Silas Burr, was Logan’s sadistic drill sergeant from the World War I era. It also seems that Silas Burr murdered Logan’s girlfriend Janet and ripped out Logan’s eye when they fought after her death. Cyber tells Logan, “You never were afraid to take a beating,” and confirms he was transferred to a military base in Canada by Sabretooth in 1912 after committing a series of brutal murders as a Pinkerton agent in Sioux City, Iowa. Logan states that after Cyber killed Janet and ripped out his eye with such ease, “I threw my mind away an’ ran from it,” in this case to the familiar comforts of the Canadian wilderness. Sabretooth eventually hunts him down, and Cyber is able to redirect Logan’s anger and vengeance towards the growing European conflict of World War I.
Wolverine remembers mourning the loss of Janet after losing an eye in a fight with Cyber. Nick Fury provides Logan with new details concerning the man who ran the training facility in western Canada, “His name was Frederick Hudson. His brother was Elias Hudson of the Hudson Bay Company. Which you worked for. Frederick and Elias were the last of their family line after their parents died aboard a passenger ship that sank off the coast of Vancouver Island. Their sister had died around the turn of the century. Her name was Elizabeth Hudson. She was your mother.” In other words, the person responsible for Logan’s torturous treatment at the camp was none other than Logan’s uncle. And you thought your family was dysfunctional. On an especially emotional birthday, Wolverine has a hallucination of Janet. Nazi Colonel Eikert recognizes Logan in Paris during World War II, commenting that Logan has not aged since their previous meeting many years ago. This likely is a reference to World War I, though the evident familiarity between the two would suggest some sort of relationship, possibly at a prisoner of war camp. In the year 2019, in an apocalyptic future dominated by the evil alien Daemonite race, a group of mutants (including Logan) and former members of the covert action team WILDC.A.T.S. succeed in altering the distant past, thereby eliminating the Daemonite influence from Earth’s history. So while the events in the previous entry did occur, they are no longer a part of current continuity. Wolverine tells Rachel Summers that he is not afraid of death, “…it would be a relief after two World Wars.” This is the first specific confirmation that Logan did, in fact, participate in World War I. After a series of near-death experiences, Wolverine tells of a confrontation in purgatory with a mysterious figure named Lazaer. “He’s always there. Tryin’ to kill me. To pull me into the abyss. Not that I blame him. After all, I’m the one who killed him.” From a series of flashbacks, it seems that Logan killed Lazaer on the battlefields of World War I. 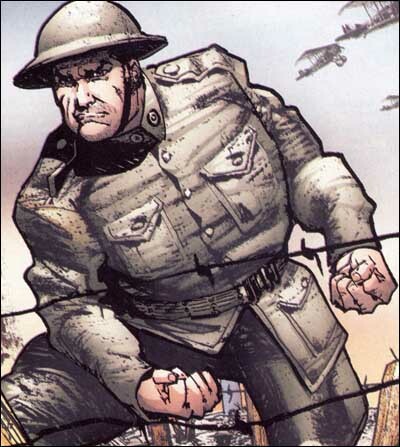 On April 22, 1915 in Ypres, Belgium, Logan fights the Germans as a Canadian soldier in World War I. His rifle out of ammunition, Logan kills a German soldier with his bare hands, noting “…for the first time ever, I feel I’m where I belong.” But a cloud of chlorine gas wipes out his comrades and Logan, healing fast, finds himself alone on the battlefield facing a host of German soldiers wearing gas masks. Desperate for a weapon, Logan breaks off the blades of two bayonets and attaches the blades to his forearms with the aid of barbed wire. There was an actual battle that took place on April 22, 1915, the Second Battle of Ypres. It was Canada’s first taste of the Great War and the first large-scale use of chemical warfare by the Germans, some 5700 cylinders of chlorine gas. Logan is shown to be a soldier in the 1st Canadian Division, though his reference to Germans as Bosch should actually be Boche, a French insult for the Germans borrowed by the English (and the anachronistic use of klik, or more commonly klick, is a term from the Viet Nam era, not WWI). With bayonet blades sticking out of his forearms, Logan slashes his way through the German army until he confronts a lone cloaked figure (later revealed to be Lazaer) bearing a long sword. The two begin a long silent fight, the cloaked figure slowly gaining the upper hand. Finally, the stranger impales Logan with the sword, but Logan pulls the bloody sword from his own body and kills the shocked stranger by stabbing him through the chest with said sword. The concept of Logan snapping bayonets in half, jamming them forcefully into his forearms and binding them with barbed wired in order to go into battle is beyond ludicrous. Why? Aside from the obvious, WWI bayonets were designed with handles (as clearly shown in the artwork itself), so soldiers could use them in combat when they ran out of ammunition. Further, Logan’s comment that Lazaer “…doesn’t smell like Nazi Bosch” does makes sense, I guess, since, you know, Nazis didn’t show up until the 1930s. And it is also revealed in this issue that Lazaer is, in fact, Azrael the Angel of Death. Logan quickly realizes that his fallen opponent was no mere human, as his ethereal form appears briefly, stating, “I haven’t been bested in combat for centuries.” Logan finds himself battling severe depression after the fight and begins to drink heavily, before finally attempting suicide. Logan opines that he “…shouldn’t be alive. Screamin’ in my ear like a coach to a lazy quarterback.” This is another anachronistic statement as Logan is Canadian and the year 1914, well before football became popular in the United States. Logan’s commanding officer calls him a hoser, a funny line perhaps, but this well-known Canadian term did not come into use until the Depression, referring to one who stole gas by sucking it through a hose. Logan talks of his time with the Devil’s Brigade and Cyber during World War II, but admits, “…just like in the First World War, we did the devil’s work. Also just like in WWI, Cyber was my commanding officer.” Whether this brigade was officially called the “Devil’s Brigade” during WWI is up for debate as there was an actual Devil’s Brigade in World War II, a joint American-Canadian Special Forces group. Great update Dig. I love this ! Great Update. It’s sad, though that Marvel is letting historical accuracy go so badly. Say what you like about Hamas run, at least it was resembly true to the events. it is a shame that there historical knowledge is so weak, especially when both world wars are so easily referenced. perhaps a historical editor of some discription is needed? I hate that Marvel/Image crossover stuff. The only one I ever liked was Team 7/Team-X . You could easily replace Team 7 with standard specops team and have an in contiuity story but with Wildcats and their Daemonite stuff, why even bother buying the book in the first place. Fantastic site, btw! Major props. I read the X-Men from age 11 to 24 or so. 5 years later, I find this site and I’m considering hitting up my local comic store again. Great work!